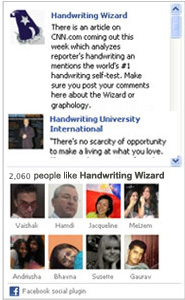 The handwriting wizard is a free service for customers and future students of Handwriting University International. Please allow 24 hours for customer service messages if no live operator is available. If you are a current student or a paying customer of Handwriting University, make sure you mention that when you call. We offer priority customer service to actual customers and clients. If you want to purchase to a DVD, book, or instructional video course, our customer service representatives can guide you to which program might be best for you. You can also visit the catalog page for an overview of which products are available and on sale. your settings properly to avoid having all legitimate email from us filtered out. Read full instructions about your e-mail application. Choose your email provider. receiving newsletters and other automated email from our company.